In a visit to the Gaza Strip on Wednesday, Secretary-General of the United Nations Antonio Guterres called for Palestinian national reconciliation and demanded that Israel’s decade-long blockade on the territory be lifted, describing life in the besieged coastal enclave as “one of the most dramatic humanitarian crises” he had seen. He said it was “important to open the closures,” imposed on the enclave, referring to the Israeli blockade that is upheld by Egypt on the Palestinian territory’s southern border. Guterres also announced the emergency release of $4 million from the UN Central Emergency Response Fund for UN operations in Gaza. 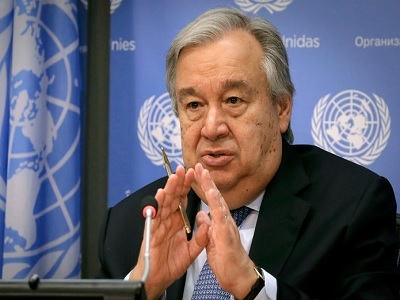 During the press conference, held at a school in Beit Lahiya run by UNRWA, the UN agency for Palestinian refugees, Guterres reiterated his support for the two-state solution in which a Palestinian state, including Gaza, would live “in peace and security together” with Israel. The Hamas government welcomed the secretary-general’s visit. 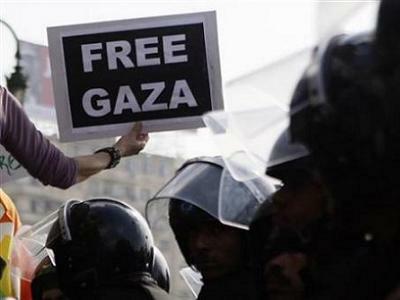 Hamas spokesperson Fawzi Barhoum said in a statement Wednesday that the visit was an important acknowledgment of the diplomatic and international importance of the Gaza Strip and of the dangerous humanitarian conditions Gazans have been subjected to for a decade under siege. Barhoum said that Hamas was hopeful that Guterres would meet with the families of Palestinian prisoners, Palestinians who need to leave the blockaded territory for medical treatment but cannot secure permission, the victims of home demolitions, and others who have suffered at the hands of Israeli aggression in Gaza. The Hamas spokesperson also called on Guterres to undertake every effort to lift the Israeli siege on the two million residents of the “biggest prison in the world,” he said, referring to the Gaza Strip.